Every company and non-profit needs a web site. It confirms you are legitimate, enables people to find you, explains who you are, and allows people to avail themselves of your goods and services. The hard part is selecting the type of web site and how much it will cost. We’ll look at the difference between a simple and complex web site, what they can do, and how much they cost. Web sites do not need to be hard to maintain or expensive. For about $300, you can have a WordPress web site that is easy for you to maintain yourself and can be easily expanded as your needs grow. With WordPress, you are not locked in to a single vendor and can completely control what does and does not appear on your site. There are other options out there that are even cheaper. Depending on your needs, they can be a good short to medium term solution. Looking for really inexpensive solution? Purchase a domain name and forward it to your Facebook or LinkedIn page. A little tacky, but your cost is under $20/year. Complex web sites allow your visitors to interact with your web site beyond a simple information request form. Complex web sites cost more, but can save you and your customers a lot of time, money, and headaches. Why would you need a complex web site? • You want to sell products or services with your web site. • Your established customers want to schedule and change their own appointments on-line. • You need to keep track of custom orders and allow your clients to view the current status of their orders along with expected delivery dates. • You need to automate in-house processes or paperwork, like warranty repairs and customer information requests. Most E-commerce solutions, surprisingly, are not that complex and can be handled with off-the-shelf solutions. Completely custom web sites can be very expensive and usually only appropriate for large corporations. In many cases, you can solve problems like those above with a custom plugin or a small amount of programming combined with an existing web framework like WordPress. Most E-commerce solutions, surprisingly, are not that expensive. If you are looking to sell just a few items on-line, a dedicated eCommerce website hosting service like Shopify or Squarespace is an inexpensive way to test the waters. For more flexibility, use WordPress with a combination of correctly configured off-the-shelf eCommerce plugins. A custom plugin or coding is only required when selling items that require complex configuration information. 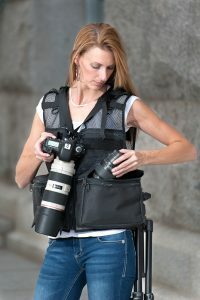 For example, selling photographer’s vest with interdependent options for material type, pocket locations, number of buttons, hidden storage features, etc. would be a candidate for some custom programming. We can assess your requirements and come up with cost effective options for solving your unique business needs. Notice: Due to the current work load, the light at the end of the tunnel has been turned off.